Jumpsuits are the kind of outfit that stay in trend year round and never go out of style. These are something that we have been loving lately and can be worn any time of the day. We wear them out in town at night for dinner, while running errands or strolling around to the mall during the day. We will even slip them on and add a few fun accessories to turn them into a great work outfit. There are so many different styles of jumpsuits that can be dressed up or down in many different ways and it slips right on when you’re rushing to get ready. See some of our fav jumpsuit occasions below to try for yourself! The mornings are a great time to run all those errands needed for the day, along with getting ready for any fabulous lunch plans. 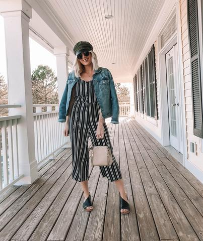 We notice that strapless flowy jumpsuits are most popular during this time of the day and can be easily dressed in a jean jacket and platform sneakers. Sandals are also excellent with this look, however walking around the city can be more comfortable with a relaxed pair of sneakers. High neck jumpsuits can be styled fancier with sneakers or sandals as well and can be worn when out for a meeting or lunch date with a co-worker. Having a large handbag or tote is extremely popular when wearing a daytime jumpsuit, too. We love walking down the street during the day and to see how others are styling their jumpsuits. Finding the right fit of a jumpsuit can sometimes be challenging. 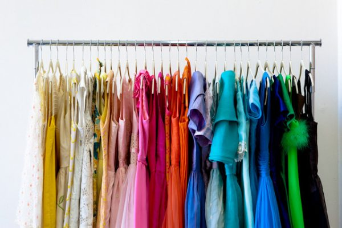 Department stores and boutiques will have plenty of options, fits and styles that you can wear both during the day and in the evening. We love slipping on a simple jumpsuit to wear to events because they are so easy to accessorize and can be worn several different ways. You can even wear it all day if you are having a busy day by slipping on a jacket or blazer. Some easy swaps to switch up your outfit can be changing the shoes or accessories depending on where you are headed to. Be sure to try out this trend, you’re gonna rock it!